A seafood selection for all of your wine favourites. There’s something so Australian about tucking into a seafood feast with family and friends! We’re so lucky to have such an incredible range available all year-round, from fresh prawns and oysters served deliciously chilled, to barbequed and baked seafood dishes full of fresh flavours. The style of wine you choose to match your seafood is dictated by its delicacy. From the classic combination of crisp Riesling with freshly shucked oysters to grilled shellfish with a modern Chardonnay, and the not so classic match of salmon with Pinot Noir, there’s a vast array of wine and seafood-matching opportunities. Dave Mavor and his family love seafood and are mad about Asian food, so a favourite at his house is steamed snapper with Asian flavours. “I’m a huge fan of alternative whites like Gewürztraminer and Grüner Veltliner which pair perfectly with this style of dish,” says Dave. 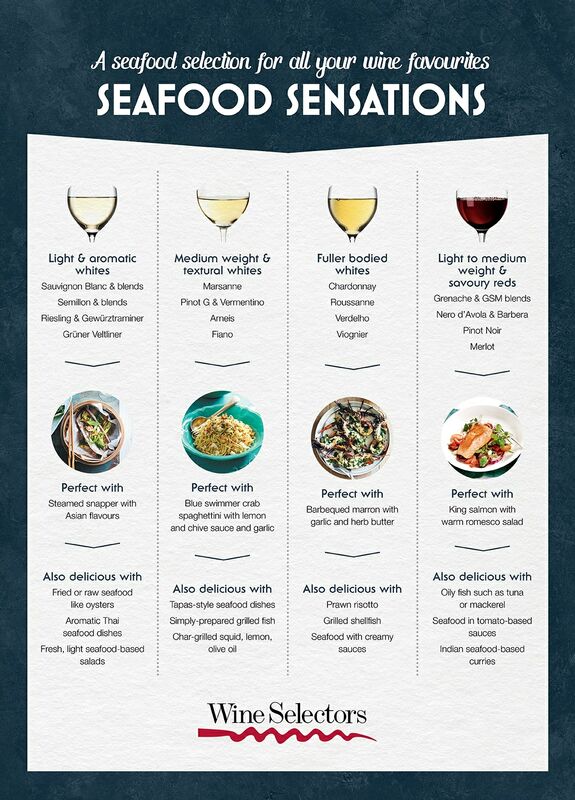 With Asian flavours also think light and aromatic whites like Sauvignon Blanc, Semillon and blends, and Riesling. Trent Mannell suggests forgetting what you’ve heard or read about red wine not going with seafood. “The richness of fish like salmon make it great for red wine-lovers,” says Trent. For this special lunch, we gave Neale the challenge of working with a lesser used rump cap as well as a secondary cut, skirt. This fact prompted Ben to reveal another unique quality of Wagyu. “Because we are growing these animals to four years of age, they are much bigger than the traditional beef animal in Australia, so they have much better muscle development. This enables us to get up to 40 different sections from an animal, whereas you only get about 16 traditionally,” Ben says. “So this allows chefs to be much more creative with these extra cuts with different textures and utilising different cooking techniques.” For the skirt, Neale seasoned the Wagyu steak then simply pan-roasted for three minutes each side, and rested for 10 minutes, before slicing thinly and placing over the pomegranate, macadamia and herb slaw salad. It was matched with the spicy fruit characters of the 2014 Heathcote Estates Grenache Noir, which highlighted the delicate flavour of the Wagyu. The rump cap was brined overnight in 5% salt and herb solution before being slow-cooked in an oven, then rested, sliced and served with a roasted carrot puree and green bean salad. It was paired perfectly with the 2012 Museum Release Heathcote Estate Single Vineyard Shiraz – its plush palate and ripe tannins accentuating the wonderfully soft ‘melt in the mouth’ texture of the Wagyu rump cap.